11 +/- Acres Estate Home! This sprawling 4 bedroom/4 full bath ranch sits at the end of a gracefully curved driveway dotted with shade trees. A wraparound and covered porch is elegantly accented with a stacked fieldstone balustrade. 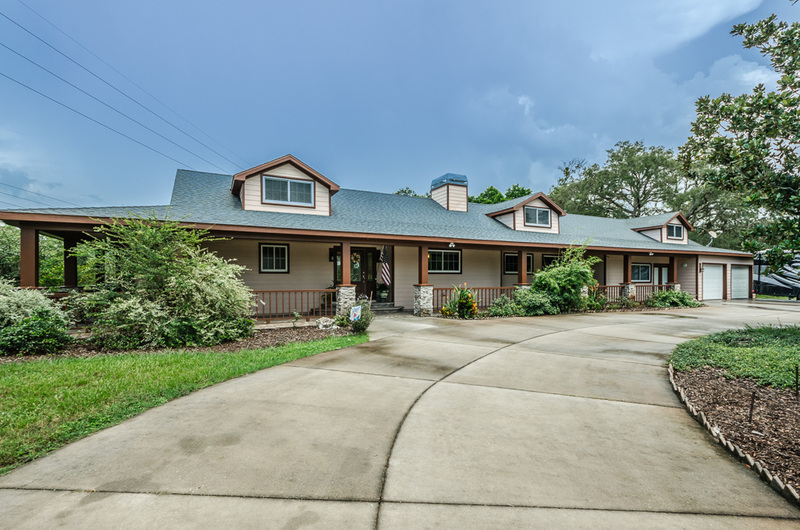 The property is approx 11 acres allowing for horses. The land CAN be subdivided; future land use is RES-6. Contact Pasco County Zoning for details. Inside, striking rosewood floors shine on the main floor. The spacious kitchen boasts 2 refrigerators, flush-mount appliances and a breakfast nook with built-in bench; double doors lead to the pool and spa. Vaulted ceilings, recessed lighting and a marble-faced fireplace welcomes visitors to the living room. The first floor master suite is richly appointed with high-end finishes, custom shower room, tons of closet space, & access to the lanai. The 2nd bedroom currently being used as office on the 1st floor can accommodate file storage, workspace configurations and room for conference furniture. A herringbone pattern floor tile and a full bath highlight the family room/media room complete with projector & retractable, ceiling-mounted movie screen. Upstairs are two bedrooms, a full bath, and a bonus room which can be converted to a 5th bedroom. Main house has extended garage with front/back doors. On the grounds, a separate building features a workshop with bath and extra garage area, a barn and modular out building. Two(2) instant hot water heaters, two(2) 500-gallon propane tanks, two(2) septic systems, & a 35 KW generator complete this corner of paradise. https://trinityeastlakerealestate.com/wp-content/uploads/2018/03/LC-WebLogo-340x156-300x138.png 0 0 loricrawford https://trinityeastlakerealestate.com/wp-content/uploads/2018/03/LC-WebLogo-340x156-300x138.png loricrawford2017-09-07 05:30:182017-09-07 05:30:1811 +/- Acres Estate Home!